I’ve been sadly and silently following developments in Manchester after the tragic suicide bombing. Today I saw an interview with Saima Alvi, Vice-Chair of the British Muslim Heritage Centre. She made the point — calmly and eloquently — that terrorism has no religion. This reminded me of Barack Obama, who knew the power of words and steadfastly refused to connect the words “terrorism” and “Islam.” Terrorists have nothing to do with Islam; they merely appropriate words and symbols from that religion of peace in order to justify their heinous acts. Mrs. Alvi was interviewed by Sky News in the bright sunshine of St. Ann’s Square on May 25. She went on to talk about her 16-year-old daughter. She said her daughter wears a hijab (head scarf), and when her daughter came home yesterday she said everyone had been staring at her. She asked, “Why were they staring at me, Mummy?” Mrs. Alvi explained that her daughter is naïve and didn’t understand how the suicide bombing had increased tensions. “But what’s that got to do with me?” her daughter asked, genuinely puzzled. There’s a point of insight here. To me (a white, non-Muslim American), a person who would blow up dozens of innocent strangers, many of them children, is a different species — almost non-human. I find it incomprehensible. So do most British Muslims. Like the 16-year-old girl being stared at because she wears a head scarf, most British Muslims consider terrorists to be a different species having nothing to do with them. Terrorists disguise themselves as Muslims, but they are not, for they have no regard for human life. I wish it were that simple. The concept of radicalisation complicates matters. Terrorist ideology tries to take the kernel of something noble in human nature and twist it to the bad. As a student of world religion, I would say that at the core of Islam is strong faith and ecstatic love for Allah and his prophet Muhammad, plus a rich culture and set of ethical guidelines. Terrorist ideology corrupts these things by mixing in an element of violent fanaticism. I understand the concept behind the British government’s Prevent programme. I can also see its flaws. Some people who implement Prevent don’t really understand the nature of religious experience in general, nor Islam in particular. They tend to view a burgeoning interest in religion as something dangerous, a symptom of radicalisation. In truth, it’s quite natural that many young people (including Muslims) will have conversion experiences which make them more religious, deeply religious. That in itself is a good thing, not bad. What’s needed is a clearer understanding that genuine religious feeling can be corrupted by bad ideas. I read the full debate on Prevent from 01 February 2017 in the House of Commons, which shows a surprising degree of accord among both Conservative and Labour MPs that the Prevent programme leads to alienation and mistrust. The hope is that some less draconian, less Big Brother-ish means can be found to address extremist influence, without imposing a statutory duty on teachers and other professionals to inform on children who show vague signs of what is subjectively perceived as radicalisation. A programme like Prevent (or something better) will meet with greater acceptance if it can develop further insight into the nature of religious experience, and the type of conversion experiences which many young Muslims are bound to have. The goal should be to support the authentic practice of strong religious faith, but to separate out (through critical discussion) the bad ideas which terrorists bring in. This is a more subtle approach which does not suspect or denigrate Muslim religion, but which tries to counter the spread of bad ideas which are not at their core Muslim religious ideas, but merely terrorist political ideas. The Government naturally have a duty to protect the public, and they are seeking to discharge that duty through the Prevent strategy. We all want to see extremism tackled, and the intention of Prevent is, in theory, to stop young people being drawn into terrorism and to protect them from extremist views that might render them more susceptible to radicalisation. We get into more difficult territory, however, when we start to tackle belief, ideas and the expression of political and religious views. The whole issue then becomes a great deal more complicated. We could find ourselves in a situation in which the Government decide which views are too extreme and debate can be shut down, so that issues that are better discussed and challenged openly are driven underground. That is all before anyone has even done anything. Prevent is operating in a pre-crime space, which sounds positively Orwellian. That is at the heart of some of the concerns being expressed about the Prevent duty. Our schools need to be places where young people can discuss any issue at all and develop the ability to see extremist ideologies for what they are. We need to help young people develop the resilience to challenge those ideologies, and if we expose them to only the views that the Government find acceptable, we deny them the opportunity to challenge alternative views and fail to equip them with the ability to think critically and learn how to exercise judgment. As I will shortly discuss, it is not uncommon for a young person to have a conversion experience which takes the form of a personal encounter with a loving God. No matter what his or her religious background (and this also happens to those raised as atheists), such an experience is certainly to be valued and treasured. It is often an ecstatic experience. I think that genuine spiritual ecstasy can have a radicalising effect on young minds, if it is not accompanied by wisdom in philosophy. Peace Studies should be part of Prevent or similar programmes. Peace Studies is a universal course of study which can help anyone — whether Muslim, Christian, agnostic, or what-have-you — to live in peace and harmony with his or her neighbours, and with the world at large. This is what God wants of us, for all of us to live in peace. Most secular thinkers also favour peace. Wars are a dreadful abomination and corruption. They should be eliminated, and one day they will be eliminated. But if human nature has not yet been perfected to the extent that it can completely eliminate wars, then let the wars be confined to conflict between combatants in war zones. To intentionally target civilian non-combatants — whether this is done by terrorist groups or government forces — is utterly wrong. One possible scenario for a Muslim youth is that he or she will grow up wanting to be as much like other (non-Muslim) children as possible. So, he or she may not place much emphasis on faith. But at some point in young adulthood, he/she may undergo conversion to a more active form of faith, including regular prayer, religious garb, and more meticulous observance of dietary restrictions. These changes may be precipitated or intensified by a religious experience of the type catalogued by William James — the kind of religious experience which is a common thread among many different religions. At the core of this experience may be awareness of a personal, loving God, and a sense of ecstatic union. Faith is not the problem, religion is not the problem, ecstatic love for Allah is not the problem; the problem comes when young people whose faith is not yet mature and tempered by wisdom in philosophy or Peace Studies are told by terrorist recruiters that their faith justifies the killing of people of a different faith, or no faith at all. I’m not wild about the government telling people how to think about religion; but to the extent this is done, it should at least be based on a more subtle understanding. I realize there are bound to be problems when government tries to distinguish between “authentic” religious ideas and terrorist political ideas. But once government has gotten into that messy business, it needs all the help it can get to sort the tangle. The importance of the Prevent strategy was made clear in the other place in 2016. I draw attention to Channel, which is one part of the broader Prevent agenda. It is an intensive, one-to-one mentoring programme that challenges violent views through the de-programming and rewiring of an individual. This view, in which the human being is seen as a kind of robot which — when it malfunctions by adopting ideas considered undesirable — is in need of de-programming or rewiring, reflects a certain secular, scientific, or technocratic mindset which is largely hostile to religion. Members of many minority sects have suffered at the hands of those who felt justified in trying to “de-program” them of religious beliefs which posed no danger, and which were sincerely arrived at by the practitioners themselves. De-programming as a proposed solution to the problem of radicalisation evokes the Orwellian world of IngSoc, and is characteristic of what’s already problematic about Prevent in its present form. The same arguments used in the past to justify aggressive de-programming of non-violent religious minorities are now resurfacing to justify aspects of Prevent: namely, that the attacks on freedom of thought and freedom of belief are justified under the broad rubric of “safeguarding the vulnerable” — that is, a “duty of care” argument. Duty of care is clear when a school teacher knows that a child is being beaten or sexually abused, or is becoming addicted to heroin; it is far less clear when a child is merely suspected of having become more deeply religious — which in some cases is all that’s happened. If the teacher’s own beliefs are Christian or Secular Humanist, the teacher may read into a child’s newfound or intensified love for Islam something sinister and dangerous which is not actually present. While it’s true that some terrorists claim to be motivated by religion, most religious practitioners — even those of deep faith and orthodox belief — are not terrorists. It is therefore inappropriate (to say the least) to treat people whose only “crime” is deep religious faith as if they were terrorists-in-training. Some may say that since I am not Muslim, it is the height of folly for me to weigh in on these matters. But as a student of peace and a person of faith, I feel it’s my duty to share what I’ve learned in life. I am not a government bureaucrat or any kind of authority figure; I’m simply sharing my personal view in a time of trouble. And my view is this: Love God, be passionate in your love of God, be ecstatic in your love of God, be certain in your faith; but don’t let anyone tell you that God wants you to kill or maim other human beings in the name of faith; for this is a terrible corruption and not at all what God wants of us. No one is more anti-Muslim than the terrorist. If your religious conversion or spiritual awakening is genuine, lasting, and true, then it should make you want to live humbly for a cause, not die blowing up your fellow human beings. You can have strong, ecstatic faith, yet also balance that with a mature understanding, so that you recognize the presence of God in all humanity and would never consider killing others of a different faith, nor would you try by force to convert them to your own beliefs. This principle applies not just to Muslims, but also to would be Crusaders. The goal of programmes like Prevent should never be to discourage strong faith or religious study, but to help young people temper their faith with wisdom, tolerance, and ideals of peace. I feel that wisdom, tolerance, and ideals of peace are fully consistent with Islam. So there need be no conflict provided we view things in a proper perspective. We need to develop the insight that faith is not bad, religion is not bad, only the problem comes when people bring in bad ideas, mixing them with the good. You can have the most delicious sweetmeats which are absolutely delightful and made from the purest ingredients — but if someone mixes in arsenic then what was good becomes completely bad and poisonous. Pure love of God is good, but if someone mixes in the idea that out of devotion to God we have to kill dozens, or hundreds, or thousands of people, then this kind of philosophy is Satan’s philosophy, not God’s philosophy. I don’t claim to have the answer. Solutions to society’s problems will come from many different quarters. As a sympathetic observer, I do think it’s possible for someone to be British to the core, Muslim to the core, deeply religious, yet 100% against terrorism. For some people, this is the ideal. There are also geopolitical causes of terrorism, as well as problems with our definitions of terrorism. Some people look at the wars in Iraq and Afghanistan and feel that Western nations are the terrorists, dropping bombs on innocent civilians. So we can say there is a vicious cycle: War leads to terrorism and terrorism leads to war. There’s an important distinction between causation and justification. Terrorism is never justified. But in looking for the root causes of domestic terrorism, we are not wrong to see foreign wars as an aggravating factor. This fact should not become a political football or part of the emotional “blame game.” Nor does this fact automatically lead to the conclusion that Western nations should play no role whatsoever in overseas conflicts. But Western nations must tread carefully, lest they be drawn into a conflict which they cannot solve, and where their use of military force only adds to senseless loss of life, or leads to abuses such as torture. The problems of war and terrorism are intractable; that’s why we need Peace Studies to help us find long-term solutions to the cycle of violence. So much effort goes into planning for war, budgeting for war, gearing up for war, studying for war. If we put even half as much effort into Peace Studies, gradually we could sow the seeds of peace, and eventually these seeds would germinate. Peace is not easy to arrive at. This is exactly why the field of Peace Studies has arisen. In order to achieve something difficult, we need to study the problem and begin visualizing the means by which we can solve it. If we just look quickly and say “Peace is too difficult, let us return to war” then we can never solve the problem. So let us devote ample resources to the problem of achieving peace, just as we have already devoted massive resources to the continued waging of war. If we never develop the vision and imagination needed to achieve peace, then we will continue to suffer the twin tragedies of war and terrorism. Returning to the topic of Prevent: Any insights into the Muslim religious experience will be fairly useless without a human connection based on honesty and trust. Where government programmes have had success, it’s probably due to individuals who made that human connection and were able to act as teachers, mentors, or positive role models. Where government bureaucrats and behavioural psychologists devise leaflets to be covertly directed at the Muslim population en masse, I doubt this has a good effect. The spirit in which a thing is done makes all the difference. Broadly speaking, counter-terrorism comes under the heading of social control. The notion of fighting terrorism by practising behaviour modification on British Muslims, pressuring them to conform to mainstream views, seems ill-fated because it smacks of inauthenticity, fails to address individual concerns, and may lack an underlying sense of warmth and caring. At its worst, the subtle message of Prevent is “Tone it down or be singled out for counselling” — but such counselling may be culturally insensitive and lead to further alienation. Insight, compassion, and caring need to be practised on an individual level to effect positive change. There must be concern for the person, rather than the desired social control outcome, e.g. “I’m here to make sure you don’t become a terrorist.” I think approaching people with that thinly veiled social control agenda is an instant turn-off. But if you’re a good teacher, mentor, role model, or simply friend, you can help someone make good choices — not by manipulating them, but by just being there for them — showing them that Britain is a beautiful place to be a Muslim, and it doesn’t involve hating anyone or bombing anything. So sorry to hear about the explosion in Manchester, UK. My heart goes out to the British people and my friends in the UK, whom I love dearly. If you’re wondering why I don’t just follow the coverage on U.S. stations like MSNBC or CNN, the coverage there is too technocratic and security state oriented. On the British channels, it’s more humanistic and about everyday people’s lives. The U.S. coverage is dominated by interviews with retired FBI and national security officials, or U.S. experts on terrorism and bomb-making. The British coverage is mostly interviews with people who were there at the concert. I would rather hear from those people what it was like. Though it’s a horrible event, there’s something comforting in the way the people of Manchester are handling it, and nothing comforting to me about hearing U.S. “experts” drone on impersonally. Of course, those technocratic experts have their value. I’m just more interested in the human side. DISCLAIMER: This information is provided as a service to those seeking information in a time of emergency. No warranty is made as to its accuracy or suitability. The author is not responsible for any problems which may arise from, or in connection with, watching Internet TV. It is suggested (at a minimum) to make sure your anti-virus is up-to-date and active before visiting strange sites. Internet TV sites come and go at an alarming rate, and don’t always keep their channels in working order. Reading this post in the future, you could find that the mentioned sites are no longer there, or the BBC News channels are no longer working. In this case, the search returned Sky News Live as the first listing. You can see the Sky News logo, the LIVE NOW indicator in red, and about 2,300 current viewers. I prefer BBC News to Sky News, but at least Sky News has an official YouTube channel which is easy to find. In the US, BBC News is catch-as-catch-can, and the links change faster than I can update this post. And to find BBC radio stations is not too difficult. If you’re still using XP, get this Microsoft security patch to help protect against ransomware attacks. Also consider trying Linux. 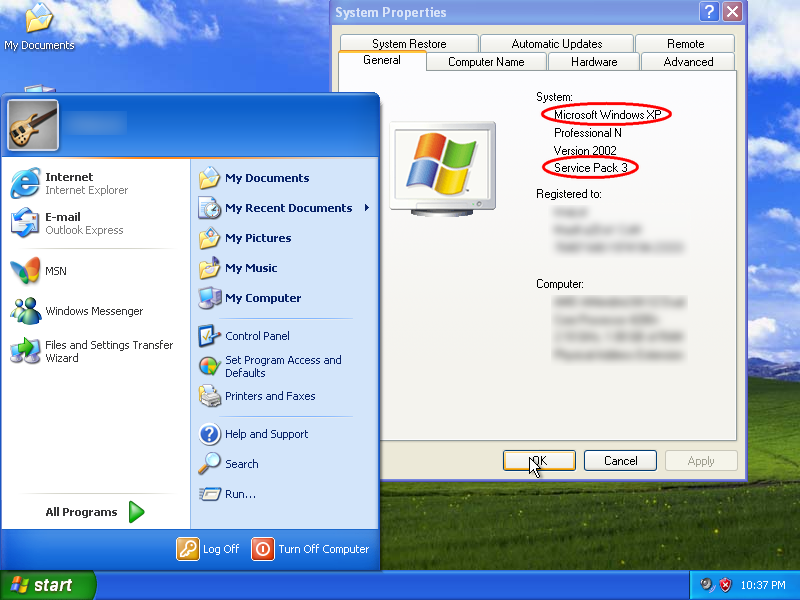 Plus more tips for Windows XP users. If you don’t have the SP3 update, install that first, BEFORE installing the anti-ransomware security patch. If you’re stuck with Windows XP because you can’t afford a newer computer that will run Windows 7, another option is to switch to Linux. There is a learning curve, but Linux is a lot safer to use on the Internet than Windows, for the simple reason that most malware targets Windows operating systems and has little or no effect on Linux. There’s also a hybrid solution for people who’ve made a major investment in hardware and software that runs on Windows XP but not Windows 7, such as older versions of commercial multimedia software, old scanners or audio/video cards with no Windows 7 drivers, etc. The solution is to use Windows XP for multimedia production, but keep it off the Internet. Install Linux on a bootable thumb drive, and use Linux for your Internet browsing activities. In Linux, you can use familiar applications like the Firefox web browser and Adobe Flash Player to play streaming video. There are also lightweight Linux music players like Audacious, DeaDBeeF, Radio Tray, and Streamtuner2. This is all free software, though most projects will welcome contributions. Back up all your personal files regularly to an external drive. Don’t leave the external drive connected to your computer or network. This way, if disaster strikes, you’ll still have all your important personal files available from the external drive. This is good advice for all computer users, but especially for Windows XP users concerned about possible ransomware attacks. If you’re stuck using Windows XP, be sure and download the latest security patch, as well as keeping your anti-virus software up-to-date. Remember to back up your personal files regularly, and also consider installing Firefox 52 ESR, which is the last version compatible with Windows XP. Try out Linux, for a safer Internet experience and more efficient computing. 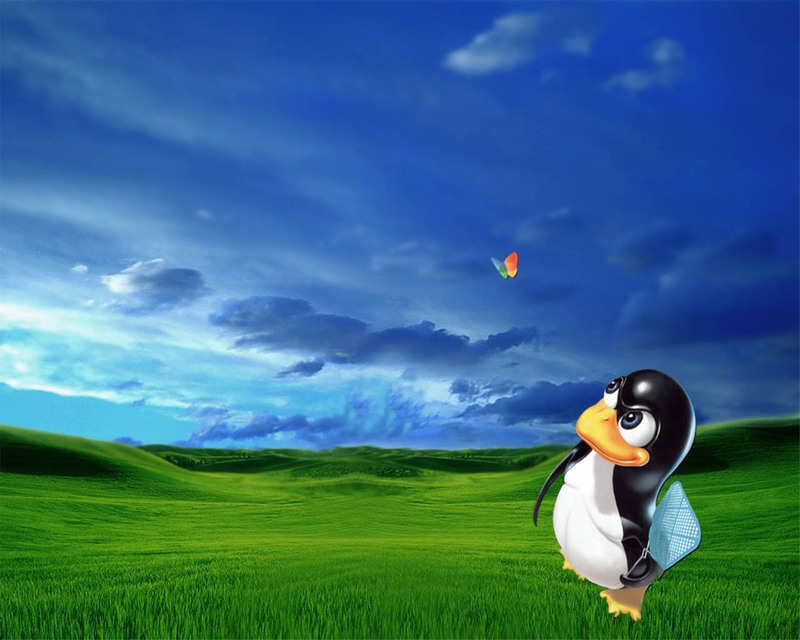 Nine out of ten penguinistas agree: Linux is geekolicious! 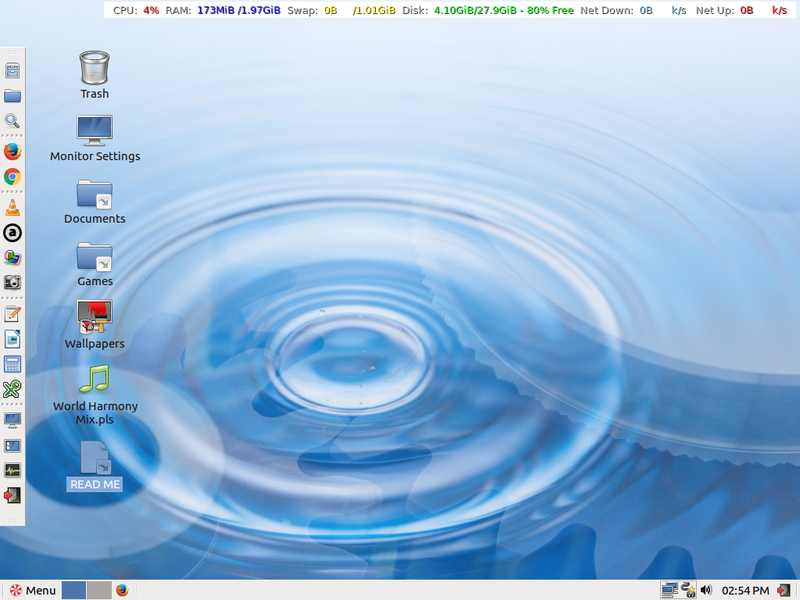 Peppermint OS 7 (Linux) with customizations. Can easily be installed on an 8 GB thumb drive. Will run comfortably on an old Pentium 4 single-core computer with 1 GB of ram. Apps shown on left panel include Firefox, Google Chrome*, VLC media player, Audacious music player, Geeqie image viewer, Libre Office Writer, Calculator, and KeePassX password manager. *For a Pentium 4 single-core computer, install 32-bit version of Peppermint OS. If you need Google Chrome, install version 48, which is the last 32-bit version before Google discontinued 32-bit support. There’s an old saying that a poem doesn’t mean, but simply is. The saying’s trotted out when folks in English class rambunctiously insist on extracting a prose meaning from a work of poetry — not unlike getting a furball out of a cat by using a brickbat. What’s implied is that poetry is a process, a way of seeing, and that it differs from prose. Try as one might, one may fail to transplant the life of a poem into some other medium. Like this, really great films may have their subject matter, but what often makes them great is their way of seeing ordinary interactions between people and how the universe works. Yes, there’s a plot and dialogue, and there may be prosaic meanings; but there’s also a certain poetry to filmic images. So if I tell you the 1969 film Z is a political thriller, don’t misunderstand or imagine it would bore you if you’re not much into politics. Like most great films, it transcends its subject matter by being about people and how the universe works. It remains as fresh and relevant today as it was when released nearly fifty years ago. Still, I was drawn to revisit Z by a number of prosaic events: the election of Donald Trump, the investigation into political sabotage of U.S. elections, and the final run-off between Emmanuel Macron and Marine Le Pen in the French race for president, which is being decided as I write. Then too, I have friends who visited Greece on a spiritual retreat over the Christmas/New Year’s vacation. Z is a French language film based loosely on political events in Greece during the mid-1960s. 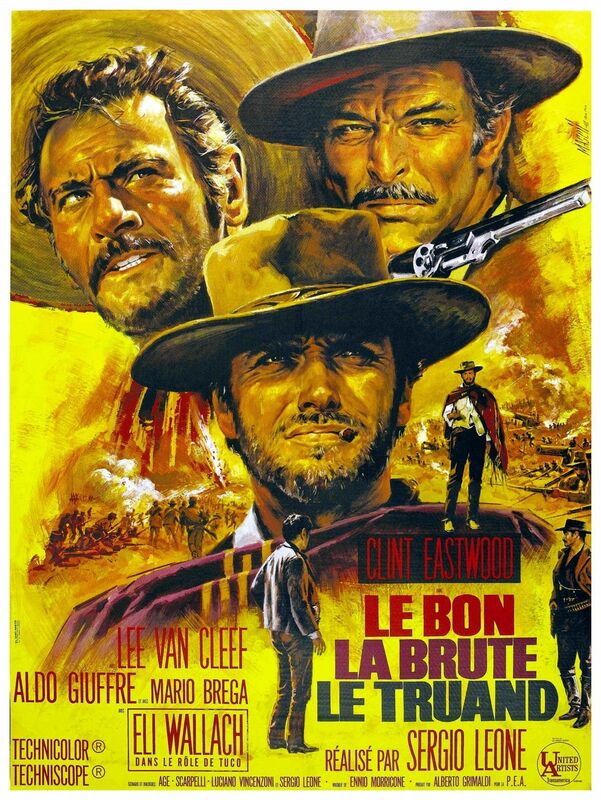 A French-Algerian production, it was nonetheless directed (and partially written) by Greek émigré Costa-Gavras, with music by Mikis Theodorakis, and Irene Papas in a supporting role. We are aware today of population explosion, on-going climate collapse, diminishing natural resources, worldwide pollution from both toxic and non-toxic wastes, and the threat of massive, globally devastating wars. People have realized, in consequence of these planetary developments, that we need to begin thinking about peace in a sustained and substantial way. Reflection on the causes of war inevitably raises the issue of structural violence (unjust social and economic structures linked with extreme poverty and deprivation) and the issue of imperialism (dominant nations acting aggressively within the world system to promote their perceived national interests). This in turn leads us to ask why soldiers are willing to fight or kill strangers at the command of their governments, and hence to questions of socialization, biology, psychology, etc. Within the peace studies movement there tend to be two broad approaches to questions of violence, war, and peace. One emphasizes the human individual and his or her consciousness and the paradigms by which he or she might be operating. Change toward peaceful behavior is often emphasized through education, consciousness raising, dialogue, … meditation, or other ways of influencing individual behavior in the direction of more peaceful relationships. They hit me. Why? Why do our ideas provoke such violence? Why do they find peace intolerable? Why don’t they attack other organizations? The answer is simple: The others are nationalists used by the government, and don’t upset our Judas allies who betray us. We lack hospitals and doctors, but half the budget goes for military expenditures. A cannon is fired, and a teacher’s monthly salary goes up in smoke! That’s why they can’t bear us or our meetings and use hired thugs to jeer and attack us. Around the world, too many soldiers are ready to fire on anything moving toward progress. But our fight is theirs too. We live in a weak and corrupt society where it’s every man for himself. Even imagination is suspect, yet it’s needed to solve world problems. The stockpile of A-bombs is equal to one ton of dynamite per person on earth. They want to prevent us from reaching the obvious political conclusions based on these simple truths. But we will speak out! We serve the people, and the people need the truth. The truth is the start of powerful, united action. The logistics of setting up this speech by the pacifist leader were mind-boggling. His supporters couldn’t get a permit, and every time they hired a hall the owner would later cancel to due government pressure. We organize a cultural event each year called the International Peace Run which is open to everyone. Hundreds of thousands of people in the world participate each year and France is the only country that has refused, several times, to grant passage to the runners. “Anti-cult” individuals follow the course of the race. This year they were in a car taking pictures. They intervene as late as possible on the eve of the event so it’s too late for us to do anything about it. In Z, the opposition has to struggle against authoritarianism and mindless bureaucracy. But sadly, these things can thrive in both right and left-wing governments. That’s why I favour liberal democracies which genuinely guarantee (in both principle and practice) the rights of minorities, whether political or spiritual. France, in its idealized form, is such a bastion of freedom. But at times it has to struggle to live up to its ideals. The past is dust, and perhaps the runners have made progress in recent years. I do not mean to single out France for criticism. It’s a beautiful country, and I greatly admire the French people for their intelligence, sophistication, language, and culture. Yet, in recent decades France has seen the emergence of a type of forced secularism which tries to eliminate all forms of religion or spirituality from the public square, or from public expression. This stems from an extreme secular view which sees religion and spirituality only as a source of conflict, but fails to recognize in them a source of peace, compassion, and ideals of self-giving. This problem is not unique to France, but is a tragedy of the modern world, in which the very real benefits of science and intellectual progress at times eclipse the spiritual aspect, which is also very real, essential to human happiness, and a natural part of life. In France, this trend toward secularism has led to laws restricting religious garb. If you’re wearing a hijab, sari, or yarmulke, you might face (legalized) job discrimination, or be barred from using public facilities. As an American, perhaps I’m naïve. While it’s true that religion can be a source of conflict, so can food. Trying to solve the problem of conflict over different religious beliefs by banning religion from the public square is like trying to solve the problem of people quarreling over food by starving them to death. Fatima Charrihi, 59, a Muslim grandmother, was the first of 86 people to be killed in a terrorist attack in Nice last summer when a lorry driver ploughed into crowds watching Bastille Day fireworks. She had left her apartment and gone down to the seafront to have an ice-cream with her grandchildren. Wearing a hijab, she was the first person the driver hit in the gruesome attack claimed by Islamic State. A third of those killed in the Nice attack were Muslims. But Fatima Charrihi’s family, some wearing headscarves, were insulted by passersby who called them “terrorists” even as they crouched next to their mother’s body under a sheet at the site of the attack. “We don’t want people like you here any more,” a man outside a café told her family soon after the attack. Hanane Charrihi, 27, a pharmacist, was so irked to find that, even after her mother’s death, the so-called “problem” of Islam in France was such a focus of political debate that she wrote a book, Ma mère patrie, a plea for living together harmoniously in diversity. The far-right Front National gained a slew of new members in Nice after the attack and now Marine Le Pen’s presence in the final presidential runoff this weekend – after taking a record 7.6 million votes in the first round – has pushed the issue of Islam and national identity to the top of the agenda. This makes for a rather easy segue into Trump World and the Muslim ban. So easy, in fact, that I won’t waste much time on it except to say that right-wing populist movements, whether American or European, find it easy to paint targets on the heads of religious and spiritual minorities. Z is not an easy film to watch. For anyone who loves freedom, many scenes will feel like vicious punches to the stomach. Several times I shuddered at the injustices being committed with impunity. The film is not a celebration of freedom and truth, but rather an elegy for these important but fragile values. Costa-Gavras turned the tragedy of his country into a grim parable about something that can happen anywhere. I’m afraid I only partially agree. I see tremendous idealism in Z. True, that idealism is dashed, but in such a way as to make the viewer long for truth and freedom even more strongly. Z is also filled with poignant observations about the human condition and the experience of grieving for a beloved person, plus rollicking satire on the officiousness and self-importance of military brass, who get their comeuppance in the end (or do they?). 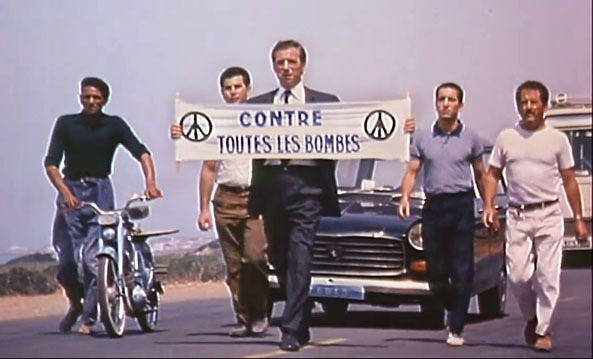 Z is not by any stretch of the imagination a religious film, but it does portray the veritable crucifixion of a pacifist political leader (played so well by Yves Montand). That crucifixion does not mark the end of a movement, but the beginning of one — or at least its re-dedication. 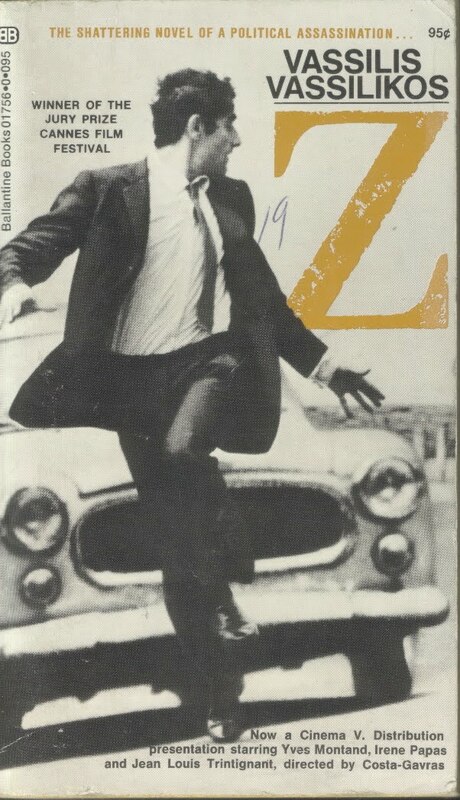 Indeed, the film’s unique one-letter title derives from the fact that the Greek letter Zeta — signifying “He lives” or “He is immortal” — was banned (as graffiti) by the right-wing dictatorship which took control of Greece in 1967. With so much art and culture scrapped by the incoming junta, many left-leaning Greeks did in fact flee to France and other nations where the political and cultural climate was more hospitable. They told their story with passion, and became a force for positive change. In this sense they were like disciples of the crucified Greek parliamentarian Grigoris Lambrakis (on whom the film is based), spreading his message of peace to the Greek diaspora, not unlike the apostle Paul. 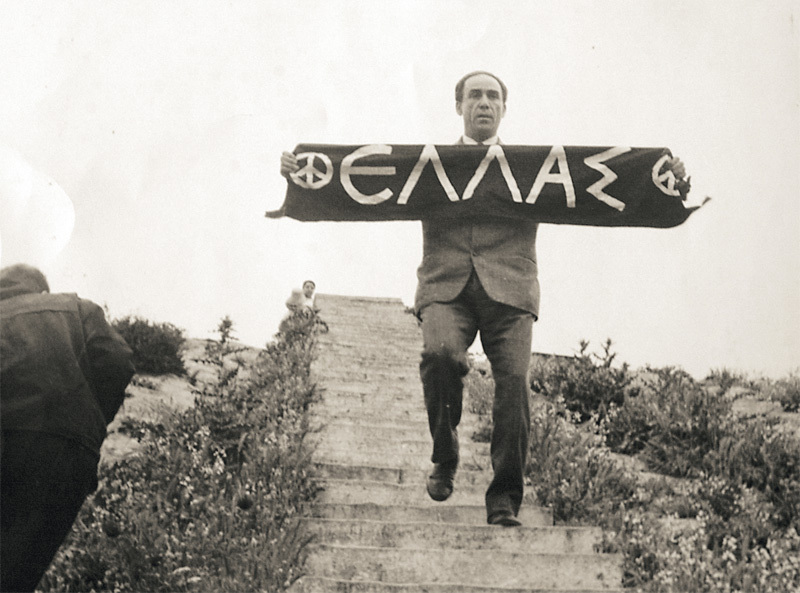 This photo of Grigoris Lambrakis marching alone in the banned Marathon–Athens Peace Rally one month before his death evokes the Christian symbol of the cross. Fifty years after the assassination of Grigoris Lambrakis, anti-fascist Greek rapper Pavlos Fyssas was murdered by a member of Golden Dawn — a far right Greek political party. This brings to mind the saying that history doesn’t repeat itself, but (like poetry) sometimes rhymes. The photo is striking, not least because it forms a pietà. Another pietà, this one courtesy Doctor Who. 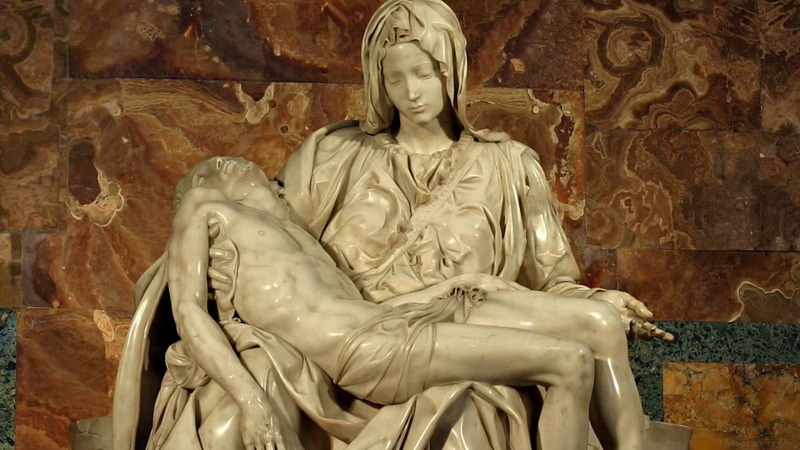 The best-known pietà, by Michelangelo. I’ve seen a number of political thrillers, and none of them has the passion of Z combined with such brilliant directing, acting, cinematography, plus vibrant musical direction by Mikis Theodorakis, whose instructions were smuggled out of Greece (since he himself was under house arrest at the time). Z IS is a celebration of freedom and truth. That the celebration is cut short in its final hours is but a bittersweet reminder that to establish anything resembling freedom and truth on earth is a constant struggle, and there will often be setbacks. Despite being about politics, Z is one of the best art films of the sixties, an absolute must-see for a new generation which may not have heard of it. It’s a film belonging distinctly to the modern era, striking for its use of flashbacks and depictions of the same events from multiple viewpoints a la Kurosawa’s Rashomon. For political junkies, the relevance of Z to today’s controversies lies foremost in the character of the inquest judge or magistrate (played by Jean-Louis Trintignant). His role is similar to a special prosecutor or independent counsel. He’s a member of the ruling party, and is inclined to accept the explanation proffered by police that the injury to the pacifist leader was no more than a drunk driving incident. As today with Trump and Russia, no proof of collusion, but plenty of coincidences! So will the magistrate have the determination and perspicacity to see the investigation through? Can he really be impartial, or will he bend to the ruling party? If he gets too close to the truth, will he be fired by the monarch like FBI director James Comey? Another important character is the photojournalist (Jaques Perrin, who co-produced). At first he seems cynical and opportunistic (we hate him when he barges in on the widow, Nikon motor drive whirring all the while), but gradually he displays kindness and devotion to truth. His own investigation uncovers facts which he brings to the attention of the magistrate. In this sense, Z is like All The President’s Men and JFK rolled into one, but is better than either. It’s an extraordinarily decent film which only improves with repeated viewings. It has more passion than All The President’s Men, reveals a broader spectrum of humanity, has better character development, and unlike JFK never descends into needless vulgarity. Another example of character development is the fig seller, Barone. We initially see him as a thug keen to participate in vigilante violence. Later we come to pity him when we find that he’s illiterate, powerless, loves his birds, and is desperately afraid of the police Colonel who manipulates him to do his dirty work. In the 1960s and 70s, as governments became subject to greater public scrutiny for corruption and malfeasance, an existing genre — the police procedural or detective story — was expanded to encompass the activities of journalists and prosecutors investigating government itself. Thus, Z is (among other things) a cracking good detective yarn with a plot twist at the end. Like most good detective yarns, it leads the viewer through different strata of society, from elite government officials, to a private vigilante group called CROC, to the daily lives of merchants and tradesmen struggling to survive, and (of course) left-leaning peace activists. For modern day political junkies, another connection between Z World and Trump World is the bizarre speech given by General Missou (Pierre Dux) in the opening scene. He claims the nation is under attack from ideological mildew brought on by parasitic agents. With the arrival of beatniks, Dutch Provos, and pacifists, sunspots appear on the face of the golden orb. God refuses to enlighten the Reds. It’s a delightfully funny crackpot theory worthy of one of Trump’s political appointees to the Department of Redundancy Department (or the Veterans Tapdance Administration). 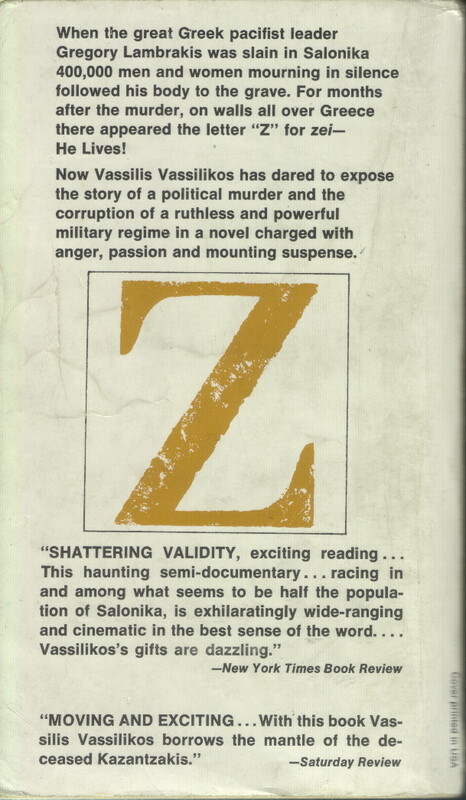 The passion and suasive power of Z is partly a function of the times it reflects: a point in the late 60s when there was still a strong streak of unalloyed idealism about the prospects for peace, and when it seemed much easier to tell the goodies from the baddies than it later became. The activists in Z aren’t perfect, but we like them because they’re courageous, idealistic, and genuinely committed to peace — even if they’re sometimes tempted to tear up the town out of sheer frustration. The demise of their leader leads them to deep soul-searching. So many of the figures who worked toward peace had great heart, and this theme is explored in Z through a heartbeat sound made by percussion instruments, and repeated reference to the strength and resilience of the pacifist leader’s heart, which continues to beat and refuses to quit. Z had a super successful run in America, where it received Academy Awards for Best Foreign Language Film and Best Film Editing, and was also nominated for Best Picture. I’m sure that for many Americans it evoked all too recent memories of John F. Kennedy, Robert Kennedy, and Martin Luther King. I’ve only skimmed the surface of Z, using it as an excuse to branch out into other matters. But that’s what a good poem does, too. It narrows your focus to details about the human condition, and that narrow focus somehow possesses the ability to widen into a view which takes in the entire universe. Puzzling, is it not? You can view the complete film in many places, including Amazon Prime and Netflix rental. In Z, the vigilante group used by the government to attack left-leaning pacifists is called CROC, or Christian Royalist Organization against Communism. Ironically, today there’s a KROC INSTITUTE FOR INTERNATIONAL PEACE STUDIES at the University of Notre Dame. (No, the picture on their home page is not a Cialis ad.) The pressing question per the film? Are they for football? This is not just movie trivia, but reveals the visual language used by the filmmaker to talk about peace vs. violence. Costa-Gavras is making a dark joke which we won’t get unless we identify the movie poster and know what critics said about the film.